Hopping Mad Designs is a Medical Web Design studio based in Sydney. We have been designing and developing medical websites for some of Sydney’s most well known doctors, specialists and allied health professionals since 1998. Our designs are fresh, unique, mobile phone friendly and super SEO friendly so that when we build your medical website it will rank on Google. We are Darlinghurst based - right behind St Vincents Hospital, so come in for a chat anytime to brief us on your next website project. As a doctor it is essential to have a website that builds your credibility online as well as providing your patients with relevant essential information. Hopping Mad Designs is able to deliver your practice a successful website solution that boosts your online profile. If you want to drive new business and increase customer inquiries speak to us now about our web design, online marketing and SEO packages. CALL US ON 02 9360 8514 to see how we can get your surgery, practice, or hospital online with a conversion focused new website. We have the skill, expertise and creativity to create a website that will not only attract new clients, but will also advise them about the types of services you offer and areas that you specialise in. We are also able to rank your new medical web design so that you appear high up in search engines results when people search for your particular specialty. Why Hopping Mad Designs for the design and development of your website? As a health professional or medical specialist, you need a website that matches your professional integrity. Hopping Mad has worked with several leading health profesionals to provide great website solutions for their practice. All our designs are fully customised, tailor made for your practice. > Patients need information.They are seeking to find out more about their doctor, as well as their upcoming procedure or illness. Having relevant and up to date information online can be a MASSIVE time saver for both doctors and patients. If for example you are an orthopaedic surgeon you might like to have an area in FAQ about post-op recovery, pre-op procedures. This is can answer many of their questions and your patients will enjoy doing their own research without the need to disturb you. > If you have a surgery, people want to be able to find out a little bit more about you and your services before they make the trip to see you. They want to be able to go online, search for the closest medical centre or practice in their area and make their decsion based on what they read on your website. If they cannot find your website or they do not like what they see, they might go elsewhere. > If you are running an extremely busy practice then a website will allow you the freedom to palm off a lot of questions that patients might have, for another time. We can design and build a patient inquiry form on the site that will allow you to address questions at a time when you are not so busy. 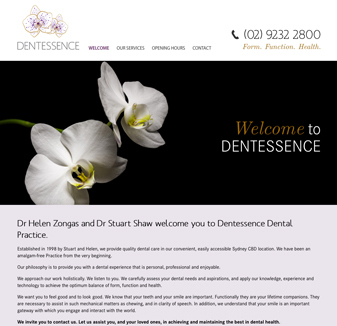 Brand development and website for boutique dental surgery Dentessence. Having a professionally designed website by Hopping Mad Designs means that your surgery or practice will look more ethical and trustworthy – CALL 02 9360 8514. > It’s a great way to showcase your level of experience and education. You can have an area of the site where you can let your prospective patients learn about your extensive medical experience as well as accolades you have received. Its a great way to sell yourself before you even meet your patients. > With technological advances you can actually show virtual procedures. This way the patient know just that little bit more about the operation prior to the day. Its a great education tool and having this on your medical company web design will add value to the online customer experience. Hopping Mad Designs has been working with a number of medical professionals since 1998. Some of Sydney’s best known doctors and specialist come to us for design, marketing advice as well as learning about the digital environment and how it can help them make their life easier and drive business. We specialise in medical web design, this means we have a clear understanding of your business and practice needs. We know what clients are looking for and can advice you on site layout, design, content as well as getting you found online. We will provide you with a custom website of the highest design standard. When you get a medical website design by Hopping Mad you will never get a mediocre design. Your website will have that professional design edge it needs to elevate your online digital profile. We will help you with domain name registration. Choosing a domain name is critical in getting an online ranking these days and getting the right domain name could have a huge impact on your business. We can help with writing your content for the site. We have copy writers who are able to write medical content saving you the hassle. All we need is a brief outline of your areas of practice and we can handle the rest. All the content will be written so that it is search engine friendly giving your web site the best opportunity of getting found online. We will develop a website for your practice that you can easily update and manage yourself. Our WordPress content management system ( CMS) allows you to publish articles, add staff members, basically make any copy changes through out the site that you can think of. Its easy to use and very uncomplicated plus we will train you and your staff in how to use the system. We are fast, accommodating and responsive. Because we have dealt with many doctors and specialists over the years we know that your time is critical. We will get you found online. We make sure that all the pieces of the web puzzle fit together so that you have the very best chance of getting found online. You cant just design and develop a new medical website and expect it to rank on page one of Google. As web professionals we make sure that everything we do in the web process leads you to a great page 1 ranking. This happens from the web briefing stage at the beginning where we discuss site content, domain names and navigation through to coding, labeling pages with relevant titles and tags to uploading of the site. When you see your site on page 1 of Google for your practice areas you will realise the benefits very quickly. We can manage your reputation online. Another very important thing to consider is your online reputation. If you type your name in to a search engine, what information comes up and what have past patients said about you? Hopping Mad Designs works with a team of top online developers who are able hide negative or bad comments about you on Google. So if you are a health professional, doctor, medical specialist or the manager of a medical practice and are looking to get a new website CALL 02 9360 8514. If you want to rank on Google then please let us handle your SEO. We are seriously good in this space. Give us your main keywords and we will rank these for you. We are an established design agency that knows what it takes to make your website stand out from the other medical sites out there. We are a full service digital agency so we can handle all your social media, content marketing and manage any negative online reviews that may have popped up.